One of the Africa's most elusive antelope is the Sitatunga. The Okavango is one their last refuges and is one of the best places to see them. 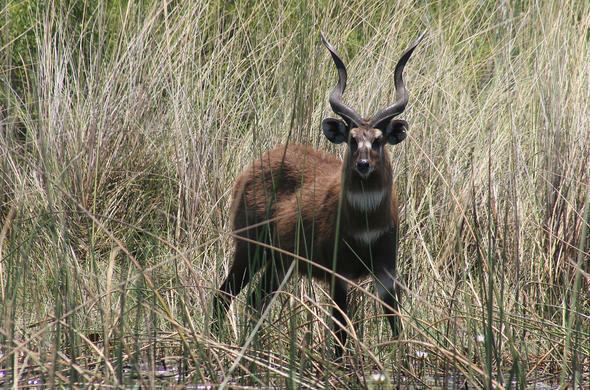 When people talk about the Okavango you hear a lot about an elusive animal called a Sitatunga. Their scientific name is Tragelaphus Spekii. 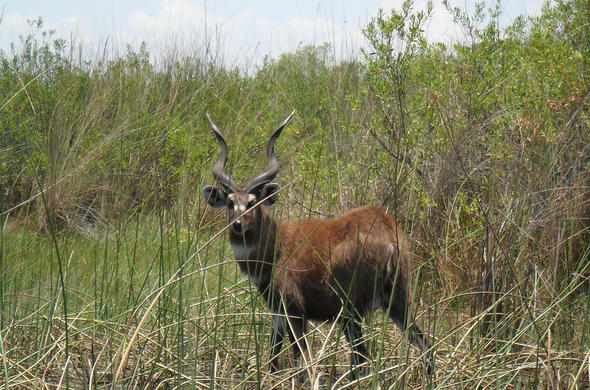 They are Africa's only true amphibious antelope; it is specially adapted to living in swamp-like conditions. It only occurs in Central African countries. It is found throughout wetland areas in the Congo, Cameroon, Ghana, Gabon, Tanzania, Kenya and in the Okavango in Botswana. Sitatungas are about 1.5 meters tall. They have a dark brown waterproof coat. The males are usually darker, while the females have a reddish brown coat. Both sexes have white stripes running down their sides and across their back. They have a sprinkling of spots on their back flanks. Both males and females have a mane of hair around their neck and twisted horns that can grow to 1m in length.Their most special adaptation is their long splayed hooves that allow them to distribute their weight when walking over the soft marshy ground. They actually have difficulty walking on firm, solid ground! They are extremely good swimmers and will take to hiding underwater with just their nostrils out of the water, to escape predators or are threatened. They have been known to sleep like this underwater. As they occur in such a limited habitat and spend most of their time in thick reed beds, most people on safari do not get to see them. In some parts of the Okavango you are more likely to see them. They live in think reed beds and banks of Papyrus. They love water and are excellent swimmers. Sitatungas have specially adapted hooves that allow them to move easily through the soft swampy ground.You are most likely to see them in the thick reed banks deep in the permanent Delta. It is best to approach them by Mokoro as they spook easily and will hide easily. 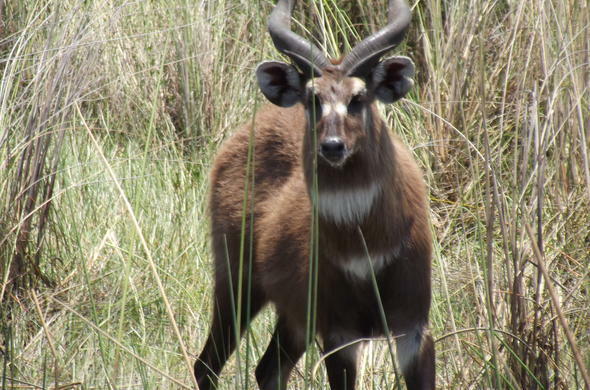 You are most likely to encounter them in the Shinde and Jao and Vumbura areas of the Delta, though they are found in other areas of the Delta as well.Sitatunga are preyed upon by Lion, Leopard and Wild Dogs although as they live in such wet and sheltered areas that they are relatively safe. They take to the water, or disappear into think papyrus banks at the first sign of danger.